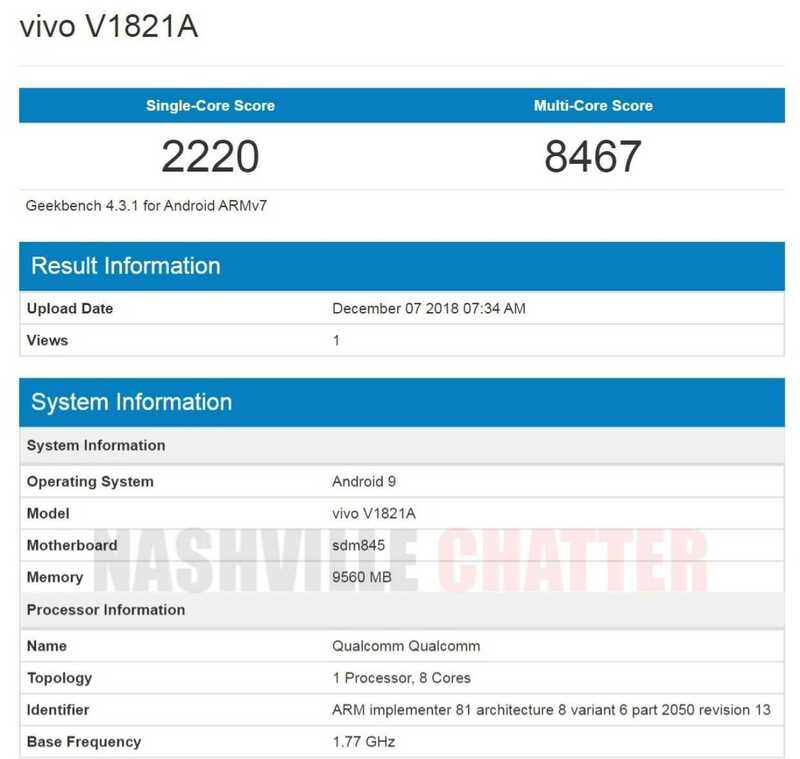 Vivo V1821A, that is believed to be the upcoming Vivo NEX 2 dual screen smartphone, has appeared on Geekbench today. The same model number was spotted along with V1821T in the previous month on the website of 3C authority. The 3C certification of the phone has confirmed that it will be support 22.5W fast charging. The Geekbench appearance of V1821A has revealed some of its specs which suggests that it could indeed be the Vivo NEX 2 dual screen smartphone. The Vivo V1821A listing has confirmed that it will be the first Vivo phone to come equipped with 10 GB of RAM. The flagship phone is powered by Snapdragon 845 chipset. It will be the first smartphone from the company to arrive with Android 9 Pie OS preinstalled. In the single-core and multi-core tests of Geekbench, the alleged Vivo NEX 2 dual screen smartphone has respectively scored 2220 and 8467 points. There is a possibility that the 10 GB RAM edition of the Vivo NEX 2 may feature an inbuilt storage of 128 GB or 256 GB. Vivo has confirmed that it will be launching the Vivo NEX 2 smartphone on December 12. The smartphone is expected to arrive with a front screen of 6.5 inches. The smartphone will be featuring a second 5.5-inch display on its rear. The backside of the phone is interesting since it is equipped with RBG-lit Lunar Ring for notifications. Above the second display is the triple camera setup which includes a ToF (Time of Flight) 3D depth sensor. The Vivo NEX phone came with a revolutionary pop-up selfie snapper. It appears this feature won’t be available on the upcoming Vivo NEX 2. The rear mounted cameras can be used for shooting superior quality selfies. There is no information available on the other specs and pricing of the smartphone.